For years and years and years my favorite color was pink. I was the little girl who took ballet, wore dresses every day, loved playing dress up and house, and inevitably was always the mom. Girly girl to my core. After which I sadly had a weird identity crisis where I just wish I could forget everything I wore from age 14 to about 21. Please tell me I am not alone in this...? I finally figured myself out and found my perfect balance of practical and feminine but not necessarily 'girly' then fell back in love with pink in small doses. I have loved it in prints but not usually solids and especially not for a large garment. 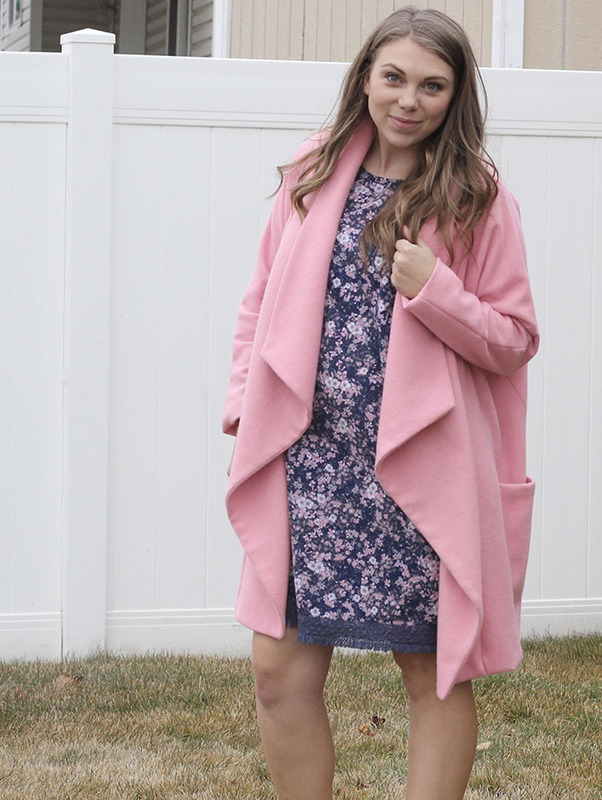 But over the last year or two its been making quite the come back in my wardrobe and I decided this year that I wanted something a little more fun - and a pink coat fit the bill perfectly! So when we planned the coat making party for January I was really hopeful I could find some pink wool. So off I went to source the perfect materials and pattern. The pattern was easy peasy. I have had the Lola Coat pattern by Sew Over It ever since the City Break Capsule Wardrobe e-Book released and knew it would be the perfect shape, but fabric was trickier. Everywhere that sells wool sells it in the typical (practical) colors. As mostly a practical person myself that would have been fine for any project except this one. Camel, navy, and olive may be some of my favorite colors but they weren't going to cut it this for this. Enter Riley Blake Designs! They have just released a line of washable - yes washable- wool and it comes in fun vibrant colors. (Note* I wouldn't recommend washing it, but you can wash a sample piece and see what you like. I found the washed piece became much more itchy.) I ordered the color 'carnation' and actually thought it was too pink at first, as I wanted something more mauve or blush, but I actually have kind of fallen for it. It works well with quite a few dresses I have made and its fun to wear such a saturated color in the winter! Because I made it in wool, I opted to line it. My lining fabric is some random poly I picked up at a thrift store back in college. Its just been hanging out forever and this seemed the like perfect time to use it. The pattern does not come with lining pieces or instructions but it was incredibly easy, and thats coming from someone who has never made a coat, done a coat lining or bagged a lining. So if I can do it you can, too. I just used the same pieces (you have to overlap the side panel and the pocket piece to form a lining piece there) but other than that, easy peasy! There is a great tutorial online here for how to bag a lining, but honestly it was pretty intuitive except for the sleeves. I did that wrong at first and had to figure it out but I got it right the second time. 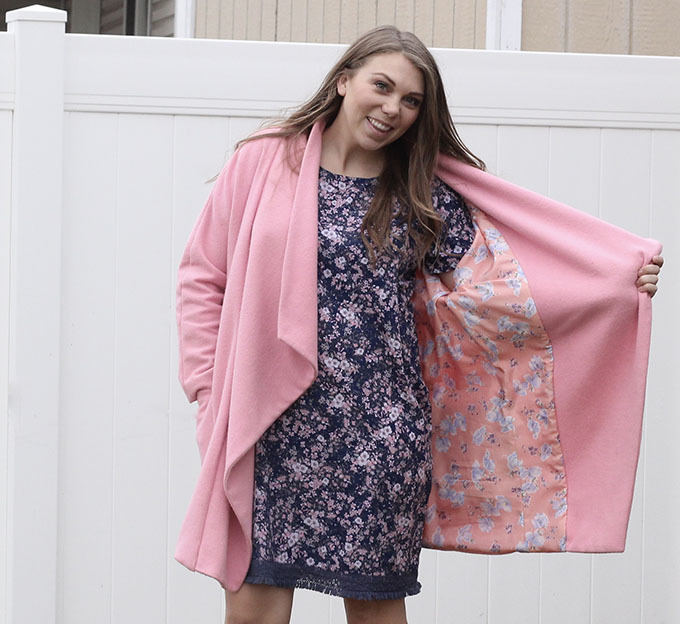 I am excited to wear this with so many different outfits to brighten up winter and its a great transitional piece into Spring since its not a traditional heavy coat. You'll be seeing this one a lot! If you want a lot of great coat inspiration check out the #coatmakingparty on instagram and see what people have been sewing this month! Obsessed with this coat! Love it.